For the past 6 weeks two words keep coming up: waiting and hoping. It began with a weekly devotional we often follow. 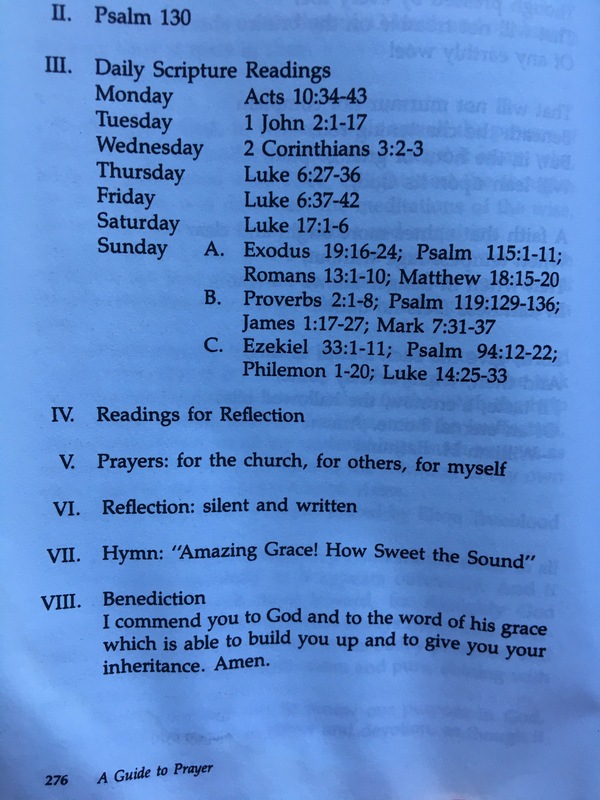 In this particular devotional each day of the week you read the same Psalm and each day a different other scripture as well. After spending a week praying Psalm 130, which quite a remarkable short prayer, I (Shawn) was reminded of one of my favorite books, Eugene Peterson&apos;s, A Long Obedience in the Same Direction. In this book Peterson unpacks the Psalms of Assent (Ps 120-134). I pulled the book off the shelf, Anna and I read the chapter on Ps 130 aloud together, and there were those two words again, waiting and hoping. waiting: going about our assigned task confident that God will provide the meaning and the conclusions. hoping: a confident alert expectation that God will do what he said he will do. As we approach the six month mark of Anna&apos;s diagnosis we find ourselves waiting and hoping. Anna is certainly, "going about her assigned task" with diligence, as she is the model patient for both of the doctors who are partnering with her, in terms of following their protocols, food regimen and exercise to the letter. And hoping, uh yeah, she&apos;s hoping. Did you know the word confident, which is in both of Peterson&apos;s definitions, is simply two words put together? Con-with and fidere-faith. So to do something with confidence is simply to do something with faith, with belief. It&apos;s often hardest thing to surrender control and believe, but that is the road we find ourselves. Speaking of practical waiting (going about a task…) Recently, one of Anna&apos;s doctors recommended infrared sauna, as there are tons of benefits to the body and quite a bit of research on cancer fighting properties. Anna looked on Craig&apos;s List and, sure enough, she found a person selling an almost new one one for a reasonable price. I went to go check it out, and it was awesome! As the sauna owner and I finish loading up this infrared cedar sauna in our van (still can&apos;t believe it fit! ), I hand him an envelope of cash, "count it to be sure it&apos;s right," I say. The man pauses, looks me in the eye while holding back a tear in is own eye, and says, "It&apos;s not right…" and hands the money back to me. "Go home and take care of your wife and kids. I hope this sauna helps your wife." There it is again, hope. That&apos;s what&apos;s going on around here. We are waiting and hoping. Waiting, especially, is hard. We live in a culture that does not like to wait. And hope, whew, just turn on your newsfeed and it appears that all hope has been lost in our world. Yet, we hope. Thanks for your continued prayers. As you think about Anna and our family, think, waiting and hoping. And perhaps return to those definitions and ask yourself what you might be waiting and hoping for. In one sense you’re waiting! But actually it’s such productive waiting. I continue to pray and be thankful for your life , hope, writing , wisdom. I also wanted you to know that I go in on Monday for a double mastectomy. It’s prophylactic. I’m BRCA+ and have had several suspicious biopsies. Ive decided to do this instead of “wait for cancer”. It’s big and will be brutal but I’m content to let the lord write my story. I’ll be praying for you through it all anna — wishing we were together. Different journies but so much love and respect and fortitude and faith in common. Continuing to PRAY! Thank you for the update. Hoping with you guys and love you! Love this awesom message and your beautiful family!